Time of Origin: Distant planet of Excelis, although where and when it is in relation to Earth in terms of both Time and Space is unknown. 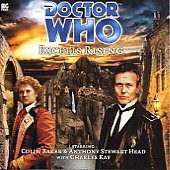 Appearances: "Excelis Dawns", "Excelis Rising" and "Excelis Decays". Doctors: Fifth Doctor, Sixth Doctor and Seventh Doctor. 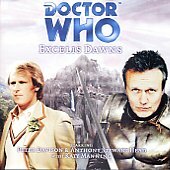 Companions: None, although Fifth Doctor did leave Tegan Jovanka in the TARDIS during "Excelis Dawns"
History: Grayvorn was originally just a simple warlord in the city of Excelis on the distant plant of Artaris, either a human colony that had lost all knowledge of its origins and had to begin from scratch or an entirely new species that simply bore a physical resemblance to humans. As a child, Grayvorn was lured away from his native village by a charismatic stranger who promised him adventure but instead sold him into slavery. Grayvorn grew to see life as a great cycle of enslavement and retribution, but he sometime dreamed of more than that; when first meeting them, he allowed the Fifth Doctor and Iris Wildthyme to live because he sensed that they will play important roles in the destiny of Artaris, knowing from the moment he saw The Doctor that The Doctor had a power which Grayvorn could use to change the future. Everything in Grayvorn's life changed when he took on a quest to find the Relic, a mysterious artefact that was said to be the key to bringing Artaris to a bright, prosperous future if one who was worthy found it. Believing himself to be worthy, Grayvorn set out on the quest, but found himself saddled with three curious companions; Sister Jolene of the convent of Excelis, Sister Iris Wildthyme, a renegade Time Lady with a drinking problem who had the map to the Relic, and The Fifth Doctor, who had stopped on Excelis to give the TARDIS a rest after transporting the Gravis to another planet ("Frontios")... Having Iris along on the trip meant that, much to Grayvorn's displeasure, the quest would be undertaken in Iris's TARDIS, a Type 39 that was smaller inside that outside, currently had a broken dematerialisation circuit, and was stuck looking like the number 22 double-decker bus to Putney Common. During the quest, Jolene revealed to The Doctor that, although Grayvorn was the only person who could find the Relic, he mustn't be allowed to tap its powers for himself. The Doctor also learned from Iris that the Relic permitted the flesh-eating zombies that guarded it to live beyond death, but what none of them knew was that the mysterious Zombie King, who owned the Relic, knew that they were on their way, and feared them taking the Relic. When they reached the edges of the Zombie King's home, Sister Jolene ran away from the others while The Doctor was occupied with repairing Iris' dematerialisation circuit to try and gain the secrets of the Relic, but, to make things even more complicated, a mistake in the coordinates entered into Iriis's TARDIS resulted in Grayvorn learning that, two thousand years in the future, Artaris would have become a barren, radioactive wasteland - a future that Grayvorn vowed to prevent. Over the course of the next thousand years, Grayvorn rose to a position of power in Excelis, changing his name and identity as time went on to avoid suspicion, but he was forever tormented by his inability to sleep; The humanoid brain wasn't designed to function without dreams, which it needs to process the events of the day, and so Grayvorn 'dreamed' while awake, experiencing waking hallucinations, intermittent periods of madness where he was delirious and referred to himself as 'we' as the spirits of the Relic spoke to him. Despite the curse it had forced upon him, Grayvorn was still determined to find the Relic, and, eventually, under the name of Reeve Maupassant, he tracked it to a museum in Excelis, arriving shortly after an attempted burglary on the Relic... and meeting a man in a multi-coloured coat with curly blond hair and a blue box referred to as a TARDIS, who called himself 'The Doctor'. Unable to reveal Maupassant's true identity without being exposed as a fraud himself, The Doctor was forced to play along with the investigation into the Relic's attempted theft, and answer Maupassant's questions about his change of appearance. However, since The Doctor believed that regeneration was too difficult a concept for Maupassant to understand, all that Maupassant discovered from questioning him was that The Doctor's body was different from their previous encounter but the mind was the same... which led to him making a seriously erroneous conclusion. Learning that the thief who'd tried to steal the Relic had been hired by a third party, The Doctor realised that Maupassant was behind the raid, intending to trigger a failed theft of the Relic and then claim it for himself under the guise of 'protecting evidence'. After a séance (The spirits of the dead being able to communicate with the living on Artaris), The Doctor was able to confirm Maupassant's identity... and realised what he was trying to do. Maupassant believed that The Doctor had transferred his mind into another body, and now, to rid himself of the Mother Superior's mind, he was going to use the Relic to transfer one of them into another body (Which spirit - his or the Mother Superior's - he wanted to transfer is unknown even now). However, just as Maupassant tried to open the Relic to transfer the second soul into a new host, he was distracted by Danby, an Inquisitor who had been helping The Doctor's enquiries, giving The Doctor the chance to open the Relic on Maupassant and apparently absorb both Maupassant and the Mother Superior into it. However, this was not the case for Grayvorn. The museum was a very old building, and Grayvorn had great strength of spirit, and even though he’d now been reduced to a shadow of himself, trapped in this ancient stone structure, both the Mother Superior and The Doctor had shown him that it was possible to transfer his mind into another body. Surviving as a psychic matrix embedded within the building itself, Grayvorn gradually grew in strength until one day he had the power to possess an unfortunate visitor, reshape the body into his own image and grant it immortality - Grayvorn reborn. Using this new body, Grayvorn established himself as a totalitarian dictator on Excelis, taking the name of Lord Vaughan Sutton, and rewriting history to portray his past identities of Grayvorn and Maupassant as a great hero and the architect of reason respectively. Learning a great deal about genetics, Sutton created 'Meat Puppets' animated by the souls and flesh of abducted citizens, and ensured that Excelis would remain in a state of perpetual warfare so that he would remain in power. However, for his plans to spread further, he required a key factor for his success, and this factor eventually came when the Seventh Doctor returned to Excelis and was separated from the TARDIS during a riot. Sutton stole the TARDIS, knowing that The Doctor would come to look for it, and waited in the Imperial Museum until The Doctor finally arrived. This confrontation revealed the reason The Doctor was constantly drawn back to Excelis; on his first visit, he made contact with the still-intact Relic, and his soul became a part of it, thus meaning that a part of him always remained on Excelis. Sutton was determined to use The Doctor's knowledge to spread his evil among the galaxy, but The Doctor refused to help, instead finding and opening the Relic - which Sutton had been using to animate his golems - allowing the rest of his soul to join with it. While linked with the Relic, The Doctor made contact with the many spirits in the Relic - including Grayvorn's old foe, the Mother Superior, who revealed that The Doctor alone had the power to offer the souls in the Relic true peace. With the souls freed from the Relic, Sutton could no longer use it, but rather than accept defeat, Sutton activated the orbital defences, vowing that if he couldn't have Excelis, nobody could. Forced to leave his allies behind, The Doctor managed to retreat to the TARDIS, but, as soon as he'd entered the ship, Sutton appeared outside, threatening to kill an innocent man if The Doctor wouldn't let him in. Knowing that Sutton's link to the Relic meant that he would be able to operate the TARDIS, The Doctor was forced to lock him out, and wait out the nuclear holocaust triggered by Sutton. The Relic might survive (Being the product of advanced technology), and some of the planet's population could wait out the devastation in the shelters, but Grayvorn was gone forever. 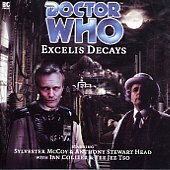 Despite this, The Doctor departed Excelis hating himself for what he'd been forced to do, ending that chapter of his life and leaving Excelis a barren, radioactive wasteland - the future that Grayvorn saw from Iris's bus so long ago.